HelpAge has published an 8-page briefing on social pensions in Mexico that is now available online. Until recently, there was no social pension provision in Mexico; all pensions were earnings-related, financed with government subsidies and payroll taxes. Mexico introduced social pensions long after other Latin American countries, and for that reason had pension coverage of only 22 per cent as late as 2000. Just 13 years later, 88 per cent of older people had pensions. Nearly all of this remarkable increase in coverage was due to social pensions: non-contributory benefits, unrelated to employment records. Larry Willmore. Towards universal pension coverage in Mexico. Pension watch briefing no. 13, HelpAge International, May 2014. The current governor of the state of Chiapas is Manuel Velasco Coello, of the traditional Partido Revolucionario Institucional (PRI). He won 67.1% of the vote in the July 2012 election, in coalition with two small parties: the Ecological Green Party (PVEM) and the New Alliance Party (PANAL). During his campaign, Mr Velasco promised to continue the universal pension (Amanecer) begun in 2007 by governor Juan Sabines of the leftist PRD. A monthly pension of 550 pesos (42 US dollars) was given to all residents of the state 64 years of age and older, irrespective of wealth or income, from January of 2007 through December of 2012. In 2013, the experiment of Chiapas with universal pensions came to an end. Shortly after taking office, in December 2012, the new governor announced that the Amanecer pension would continue, but with a change of rules. From now on, anyone receiving another pension – such as a contributory (social security) pension or the federal 65 y mas social pension – would not be eligible for the Amanecer pension. Many older persons had become accustomed to receiving two pensions – 550 pesos from the state, and another 500 pesos from the federal government – so were naturally upset when they were removed from the Amanecer roster. More than a thousand older residents of the state filed suits for reinstatement of rights to an Amanecer pension. Only one of these suits – that of an 88-year old woman from San Cristobal de las Casas – was successful. This was widely reported by the press on November 10th of last year. I have just completed a short essay that summarizes my work on social pensions in Mexico. Regular readers of Thought du Jour will find nothing new here, but you might want to read a concise summary. In 2000, 22% of Mexico’s seniors (age 65 and older) received income from a pension. Thirteen years later, 88% had pensions. Nearly all this remarkable increase in coverage was due to social pensions: non-contributory benefits, unrelated to employment records. This paper chronicles the rise of social pensions in Mexico. First it summarizes the pension system prior to introduction of social pensions. Next it describes how Mexico City, the federal government, and seventeen of Mexico’s 31 states initiated social pensions, a policy supported eventually by each of the three major political parties. It concludes with thoughts on what remains to be done. 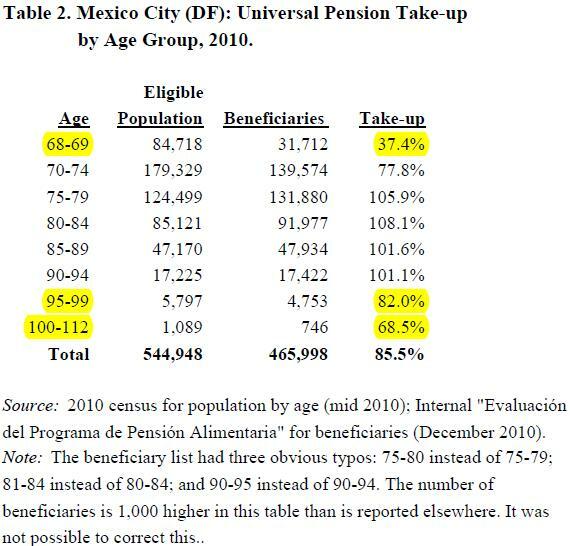 Larry Willmore, “Old age pensions in Mexico: Toward Universal Coverage”, January 2014 (13 pages). Tagged posts include the Federal District (DF), which contains Mexico City, as the DF is governed the same as any state in Mexico, with an elected governor and local Congress. Last year I blogged on social pensions in Chiapas – the only universal scheme in Mexico, aside from the Federal District, which includes Mexico City. The programme, called “Amanecer”, delivered a pension of 550 pesos a month to each senior resident aged 64 years and older. The beneficiaries numbered more than 238,000, yielding an apparent take-up (coverage) of nearly 100% of the targeted population. A new governor has repeatedly said that the Amanecer scheme will continue. But, because of need for ‘austerity’, the rules are changing. Residents eligible for a federal pension of 525 pesos (about 40 US dollars) will no longer receive an Amanecer pension. Previously, residents from age 70 (age 65 from 2013) could claim both pensions, for a total of 1075 pesos (approximately 82 US dollars). The government alleges that federal law prohibits giving a state pension to anyone who is eligible for a pension from the federal scheme. That is not true. The elderly of Chiapas now understand that they were not told the truth, and are protesting in the capital, Tuxtla Gutierrez. Now that the age of eligibility for a federal pension has been lowered to 65, only those aged 64 will be elegible for an Amanecer pension, but only until they reach their 65th birthday and become elegible for a federal pension. The Chiapas experiment has come to a close, which is a shame. Photo credit: “Reporte Ciudadano: ‘Programa Amanecer’“, Diario de Chiapas, 29 October 2013. En Chiapas, … los adultos mayores … desde junio no han podido cobrar el apoyo mensual de 550 pesos. Desde junio pasado, los adultos mayores han acudido a la sede del DIF estatal a cobrar su apoyo gubernamental, y un par de meses salieron con el desaire de los trabajadores de dicho programa, quienes les dijeron que ya habían sido dados de baja por recibir de manera paralela el Programa federal 70 y Más. …. La reestructuración del Programa Amanecer, responde a la necesidad de ajustar gastos, ya que el estado se encuentra en una crisis financiera; Velasco Coello, un par de días después de tomar posesión del cargo, -en enero pasado-, declaró que Chiapas vive “una situación económica y financiera complicada”, por lo que solicitaría a la Auditoría Superior de la Federación un informe sobre el estado que guardan las finanzas públicas de la entidad. De acuerdo con los propios beneficiarios del Programa Amanecer, se les retiró el recurso de 550 pesos, porque contaban con el Programa Federal 70 y Más que les depositaba vía tarjeta bancaria, mil 50 pesos cada dos meses, es decir 525 pesos mensuales. [Abraham] Gómez José, [integrante de la Coordinadora Nacional de Movimiento Ciudadano,] asegura que las modificaciones de las reglas de operación de la Secretaría de Desarrollo Social (Sedesol), recientemente publicadas, “no hay excepción alguna que prohíba cobrar el apoyo “70 y más” a quienes están en el padrón del Amanecer, es decir, los abuelitos chiapanecos ´pueden cobrar ambos programas. Claudia Lobatón, “Amanecer el fantasma de Sabines” Péndulo de Chiapas, 15 August 2013. Local politicians – especially in Mexico City – have voiced concern that Peña Nieto’s draft Universal Pension Law seemingly requires them to end their own programmes of assistance to seniors. See, for example, this strongly worded article (in Spanish) by Asa Cristina Laurell, co-architect of Mexico City’s universal pension: “El embate contra la pensión universal ciudadana en México“, Sin Permiso, 13 October 2013. I previously reported, here and here, that the government of Jalisco (Mexico) from 2012 was providing residents from age 70 with a top-up of the universal minimum pension provided by the federal government. This ‘fact’ was widely reported in the press, but is patently false. From May of 2007, Jalisco provided residents aged 70 years and older with a means-tested social pension. Although the facts are murky, it appears that the state government now provides no social pensions of any kind to residents. Federal benefits in this instance have crowded out state benefits. It is very difficult to know what is happening at the state level in Mexico. I think that I now have the facts straight, and hope to provide a summary report soon. While seeking information on social pensions in Mexico, I came across a 250-page “evaluation of social develpment policies in Mexico”, published in November 2012 by the Consejo Nacional de Evaluación de la Política de Desarrollo Social (CONEVAL). In chapter 3 (p. 82), there is a chart that lists (with many errors and omissions) “State pensions for the elderly, Mexico, 2011”. The chart was useful for me only because it includes (correctly, it turns out) Puebla in the list of states that with a social pension in 2011. I had overlooked this state, with a population of 6 million, so am now correcting the oversight. Consejo Nacional de Evaluación de la Política de Desarrollo Social (CONEVAL), Informe de Evaluación de la Política de Desarrollo Social en México 2012 (Mexico, DF, November 2012), p. 82. Puebla’s social pension, like the federal one of the day, was called “70 y más”, and promised a modest monthly benefit of 500 pesos (about 40 dollars). It was initiated in May 2011 by the new PAN governor, Rafael Moreno Valle. The scheme was for everyone from age 70, but was pension-tested. This excluded, then, everyone living in rural areas, who had access to a universal federal pension from age 70. Elderly residents of urban areas qualified for a state pension provided they did not receive a contributory pension from the federal government. Sufficient funds were budgeted for more than 40,000 pensioners, and 1,658 pensioners enrolled during the first month (May of 2011). By the end of the year, there were 2,146 pensioners on the list, when the programme was brought to an abrupt end. De manera discrecional, el gobierno del estado suspendió la entrega de recursos del programa 70 y Más Urbano que ofrecía apoyos por 500 pesos mensuales a los Adultos Mayores en la entidad, con el objetivo de incorporar la partida presupuestal que ascendía a los 230 millones de pesos al financiamiento de otros proyectos, como los de infraestructura que mantiene a lo largo del estado. En entrevista, el secretario de Desarrollo Social (Sedeso), Salvador Escobedo Zoletto reconoció que dicho programa fracasó en su incorporación en el estado toda vez que duplicaba funciones con el Programa Federal 70 y Más, por lo que se decidió cancelar el pago de pensiones a los más de 40 mil adultos mayores para incorporarlos a la dinámica nacional. Jorge Luis Hernández, “Suspende Estado entrega del ’70 y más’ urbano por otros proyectos“, NG Puebla, 29 November 2011. Puebla’s social pension lasted only 8 months, and reached a tiny fraction of the state’s elderly population. Mr Escobedo Zoletto, the Minister of Social Development, was able to cancel “payment of pensions to more than 40 thousand elderly persons”, even though 95% of the beneficiaries had never received a pension! Luis Aldana, “Moreno Valle no cumple, da apoyos mensuales a sólo 0.66% de adultos mayores“, Elecciones poblanas, 26 December 2011. This concludes (I hope!) my blogs on social pensions in each Mexican state. Now I will attempt to summarize all this material. It has been unbelievably difficult to uncover facts. Without the internet, the task would have been an impossible one. In 2012 the federal 70+ programme was extended – with a federal pension test – to all of Mexico, so many state schemes are coming to an end. The federal government allows states to ‘duplicate’ (I prefer to say ‘augment’) its programme, but some state governments, such as Puebla, are using this as an excuse to terminate social pensions. 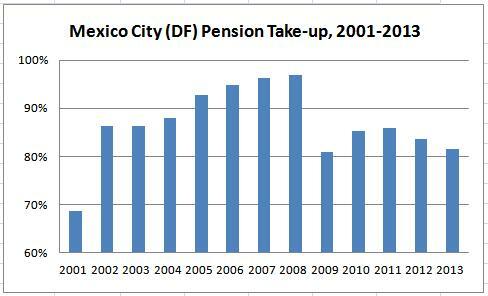 Take-up of Mexico City’s universal pension reached 97% in 2008, then fell to 81% and has not recovered. (See the chart below.) Something has happened. The purpose of this post is to investigate what, and why. Take-up of pensions will never equal 100% of residents old enough to qualify, for two reasons. First, some of the elderly will not satisfy residency requirements (three years of continuous residence, in the case of Mexico City). Second, some wealthy residents, to avoid real or perceived stigma, refuse to be seen asking government for a relatively small benefit. These two groups combined, however, will typically be a small proportion of the relevant population. This is evident in Mexico City from the fact that take-up went up quickly to 86% by the end of the second year of the programme, then climbed slowly but steadily to 97% in the year 2008. Source: Author’s estimates (see table 1). At the present time, Mexico City guarantees elderly residents from age 68 a monthly cash benefit, known as a pensión alimentaria (food pension), equal to 15 minimum daily wages. Each January, the size of the pension increases with the minimum wage. This year (2013) the minimum daily wage is MX$64.76, so the monthly pension is 971.40 pesos (about 75 US dollars). The pioneering scheme – Mexico’s first social pension – began in February 2001 for residents aged 70 years and older. The government of the Distrito Federal (the legal name for Mexico City) lowered the pension age to 68 years in September of 2009. The only requirement, other than age, is permanent residence in Mexico City, and residence must have been continuous for at least three years at the time of application. Ongoing residence is the city is required of those receiving a pension. Officials can visit a pensioner’s home on any day, unannounced. If they cannot locate a pensioner after three consecutive visits, they remove the person from the list of pensioners. 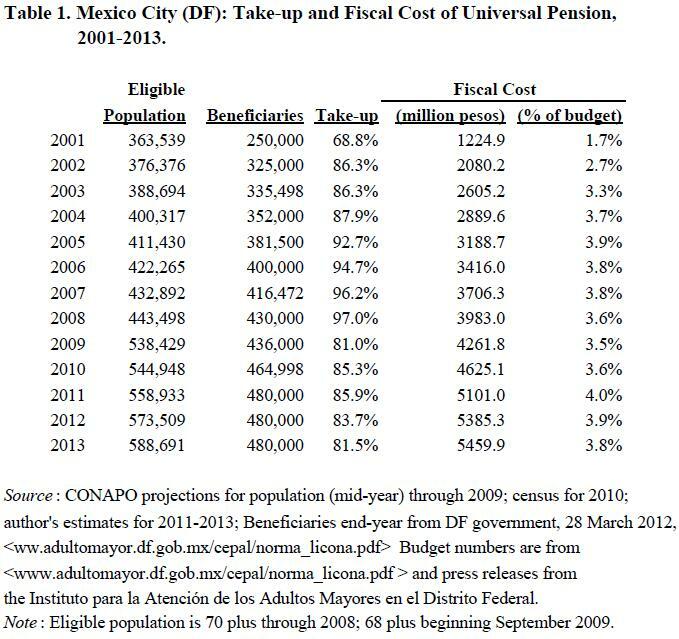 I have posted three times on Mexico City’s universal pension scheme – here, here and here – but until now never looked closely at take-up of pensions. This statistic is often referred to as “coverage”. I prefer the word “take-up” because, when an age pension is universal, coverage is close to 100% by definition. Calculations of take-up, as a percentage of eligible population, are reported in table 1 for years 2001 through 2013. The first column is an estimate of the population aged 70 plus (68 plus from 2009) in June of each year. The second column is the number who received an age pension in December of each year. The take-up, in column 3, is simply the number of beneficiaries as a percentage of the eligible population. There is a slight upward bias for our measure of take-up, since the elderly population is growing over time, and estimates are for June of each year rather than December. By this measure, it appears that take-up, as a percentage of eligible population, peaked at 97% in 2008. In 2009 the number of beneficiaries increased by 6,000 (to 436,000), but the eligible population increased by about 95,000 (to 538,429), primarily because of the lowering of the age of eligibility to 68 years, so the estimated take-up fell sharply, to 81%. The number of beneficiaries increased by nearly 29,000 in 2010, but take-up stayed low, at 85.3%. Beginning in 2011, the number of beneficiaries was fixed at 480,000, for reasons never explained by government. As a consequence, the estimated take-up began to fall once again, reaching 81.5% in 2013. The last two columns of table 1 report the budgeted cost of the pension, in pesos and as a percentage of the total budget of the DF government. In nominal pesos, the budget for the universal pension increases each year. As a percentage of the budget, however, the amount allocated for the age pension peaks at 4% in 2011, then falls in two years to 3.8% – the same level registered in 2006 and 2007. This is an obvious contradiction. How is it possible that a pension for everyone from age 68 in 2013 can be financed with the same percentage of the budget as a pension limited to those 70 years of age and older cost in 2006 and 2007. The answer, of course, is that take-up is lower in 2013. But why? This is a mystery, but an internal evaluation of data for the year 2010 sheds some light on this. Table 2, calculated by collating data from the 2010 census with data from the internal valuation, suggests that take-up by those aged 68-69, at 37.4%, was lowest of all the age groups. Detailed statistics are not publicly available on beneficiaries by age, but I suspect that the shortfall for the 70-74 age group, which registers a take-up of 77.8%, is due primarily to non take-up by those aged 70 years. Take-up by groups from age 75 to age 94 is quite high, in fact, greater than 100%. Low take-up by the older-old, those aged 95-99 (82%) and, especially, those aged 100-112 (68.5%) is troubling. This might reflect stigma, since the wealthy tend to live longer than those less fortunate. But it might also reflect lack of awareness of the universal programme by those whose mental state may not be the best. More effort on the part of government to reach the oldest citizens might yield good results. As for the younger old, whatever method the government is using to discourage their take-up of benefits, it seems to be working. So far, there have been no visible complaints, no protests.